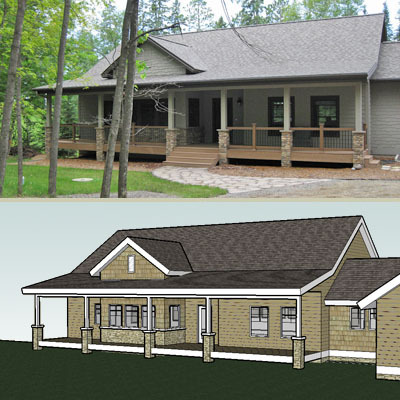 The exterior and portions of the interior of the house were modeled in the computer throughout the design process to help the owners envision the final three-dimensional appearance of their home. This allowed them to not only explore the shape and size of the final outcome, but also to experiment with textures - siding and shakes, stone and trim details. The model can be viewed from any angle to help prevent surprises when it is actually built!